Ooh, look, I remembered to do this on time this week. Yea, me! Last week we made use of real time machines, this week let's talk about how we use virtual time machines. 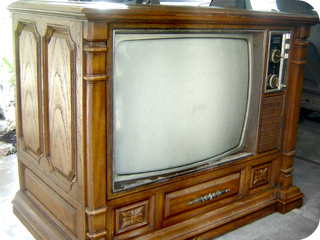 What old TV shows have you been watching lately? We'll count "old" in Internet years, so anything from more than five years ago counts. As I type this WinnieTheWoot and I are watching Stargate: Atlantis. We're a little bit past the halfway point of season one. I'm also about four or five episodes away from finishing up Deep Space Nine. It's had some really fantastic episodes but there were a huge number of clunkers as well. If I never see anyone from the alternate universe or the Grand Nagus again it will be too soon.